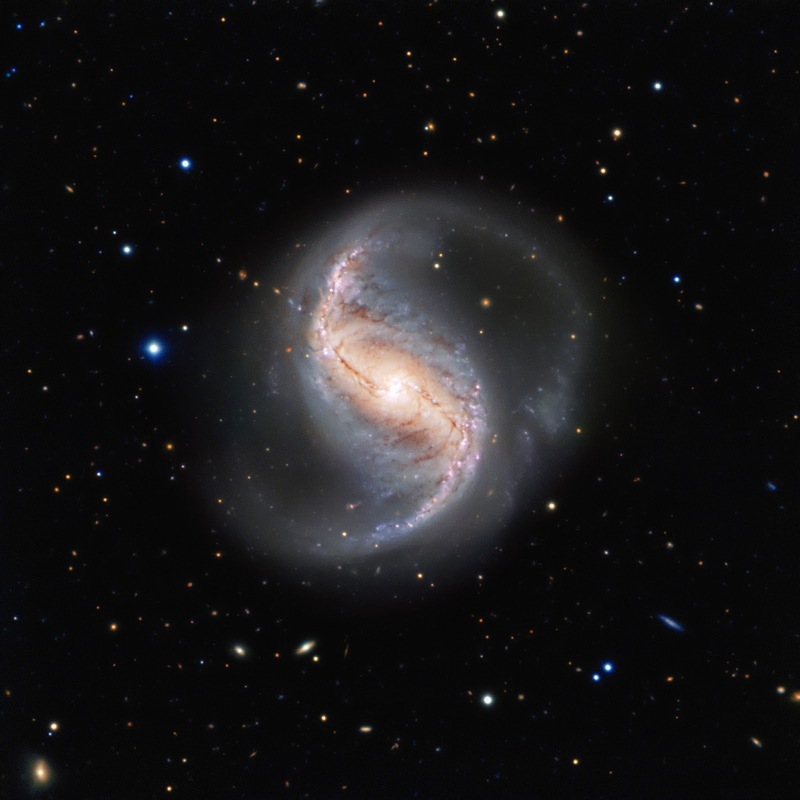 This picture shows the spiral galaxy NGC 986 in the constellation of Fornax (The Furnace). The galaxy, which was discovered in 1826 by the Scottish astronomer James Dunlop, is not often imaged due to its proximity to the famous and rich Fornax Cluster of galaxies. Which is a shame, as this galaxy is not only a great scientific object, but also very pretty. The galaxy is about 56 million light-years away and seen almost perfectly from the top, or — as astronomers say — face-on. This allows us to see the two main spiral arms and also a central bar-shaped structure, composed of stars and dust, which makes it a barred spiral galaxy. Astronomical surveys have shown that about two thirds of all spiral galaxies contain a bar, including the Milky Way. This makes NGC 986 the perfect place to study the structure of galaxies and find out more about our own home galaxy, which is difficult to study from within. This view from the FORS instrument on ESO’s Very Large Telescope at the Paranal Observatory in northern Chile comes from the ESO Cosmic Gems programme, an outreach initiative to produce images of interesting, intriguing or visually attractive objects using ESO telescopes, for the purposes of education and public outreach. The programme makes use of telescope time that cannot be used for science observations. All data collected may also be suitable for scientific purposes, and are made available to astronomers through ESO’s science archive.